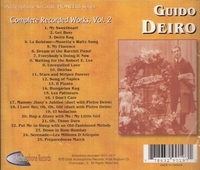 “Volume 2 of Guido Deiro's Complete Recorded Works continues the story of the man who popularized the piano-accordion and made himself a vaudeville superstar in the meantime. Once again, in collaboration with accordionist and free-reed scholar Henry Doktorski and Deiro's son, Count Guido Roberto Deiro, Archeophone presents 25 tracks by the Italian-born virtuoso who altered the way the world heard and understood the accordion. The CD includes a 24-page full-color booklet with extensive notes, meticulous restorations of the music, and one-of-a-kind illustrations from Count Deiro's family collection. Volume 2 starts with Guido's 1911 Edison cylinder of ‘My Sweetheart’, and then picks up in earnest with recordings from 1912, when he was an established star on vaudeville. He traveled by private rail car, wore the finest clothes, and spent money freely on fine food, friends, and lovers. His music showed off his bravado as well, with notable eponymously titled selections as ‘Deiro Rag’ and ‘Deirina’. These compositions, and other standouts such as ‘My Florence’ and ‘I Don't Care’, earned Guido his stellar reputation as much as his consummate playing. However, the skill is in abundance as well; Henry Doktorski writes that he believes ‘Il Pianto’ is the fullest display of Guido's musicianship--because of his skillful nuances, not because of flashiness. With ragtime's ‘second wave’ in full swing by 1912, the record labels clearly wanted more popular selections, and Guido obliged. We get Deiro's read on ragtime hits ‘Get Busy’, the rapid-fire ‘Hungarian Rag’, Irving Berlin's ‘Everybody's Doing It Now’, and Gilbert and Muir's ‘Waiting for the Robert E. Lee’. Even the more serious works are very popular ones, such as Sousa's march masterpiece, ‘The Stars and Stripes Forever’, and ‘Song of Naples’ by DeCurtis. For sheer pop fun, Guido romps through ‘Down in Bom-Bombay’, ‘My Little Girl’. Finally, ‘Dream of the Rarebit Fiend’ is a cleverly menacing piece based on Winsor McCay's comic strip of the same name. Guido's generosity extended to his younger brother, Pietro, who also dreamed of a vaudeville career. Guido gave his brother a helping hand, setting him up with a piano-accordion, teaching him to play it, and performing with him as a team. Though their partnership was a tense one--the relationship would dissolve with the brothers not speaking for years--they did record two accordion duets in 1913: ‘Mammy Jinny’s Jubilee’ and ‘I Love Her, Oh, Oh, Oh!’. Volume 2 includes both of these recordings as well as a personal essay by Guido Deiro's son reflecting on the relationship between his father and uncle. Like a modern-day rock star, Guido's status and high life made him attractive to women, and he took advantage of it. A shotgun marriage to a Seattle pianist ended in scandal, with abandonment charges, a very public arrest, and a large fine being assessed before Guido could get a divorce from one Julia Tatro. Then Guido met a largely-unknown vaudevillian named Mae West. Consumed by their passionate romance and desire to conquer vaudeville with their double bill, their marriage unraveled in bitter acrimony. The essay describes their tempestuous relationship, while Guido's son provides concrete evidence in a mini-feature about the veracity of heretofore undisclosed details. Find out, for instance, why Deiro's recorded output slows to a halt in 1916. . . .